On Monday I commented that Star Wars: The Last Jedi may do more for animal rights than Chewbacca. Or maybe it's just jealousy. If you live on the planet Crait and haven't seen The Last Jedi yet, don't read this.The new Star Wars movie contains two moments with unsubtle animal rights messages. The first is what my fiancé Lucas is now calling the "Chewbacca goes vegan" scene. 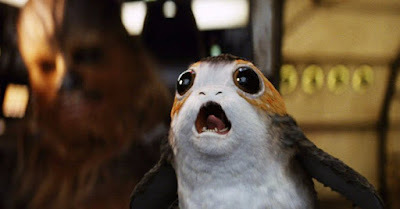 Chewbacca cannot bring himself to eat one of the adorable porgs, who strangely share an unfortunate but useful characteristic of most domestic animals: they look like babies. The second is when children liberate a bunch of horselike creatures from a cruel capitalist casino after we see the horses abused with the Star Wars version of a bull hook.